My definition of getting ahead has changed in the past two months. The time I spend on my feet is limited by my pain threshold for the day. My hip pain is a bit bipolar. It is either really ok. I'm thanking God for those good times. The VERY painful times can happen just from turning the wrong way or standing up. Randomly very annoying & limiting. I'm NOT giving up on "doing" things. But I need a plan. Hip replacement surgery date is mid December. That is 6 weeks away. Then I will be in recovery mode through New Years and into January. This weekend I spent a bit of time printing out my new 2016 planner! I'm so excited about 2016! Our family is anticipating a good year. We have many plans and dreams ready to get started! Getting ahead also means . . . The temptation is to just sit in my comfy chair(which is relatively painless) and just binge watch Netflix. Instead I'm working to put together a plan for the next few weeks that will make December & January flow better while I'm recovering from the hip replacement. Even if I'm sitting, I can be planning meals or making lessons for school ahead of time or setting up a cleaning routine for the family. I’m not looking to do big projects in the next few weeks. (Although I’d love to get my bathroom painted--anyone wanna come do it for me?) But I’m looking for ways to make life easier for my family & myself during the recovery weeks. PT exercises are so challenging for me. I like doing them but they make me hurt more so I keep avoiding them. Pray I can do them at least a few times each week! Setting up my planner for 2016 NOW! There are a MULTITUDE things running around in my head right now. So I am setting up my planner for November, December & on into next year. This may not seem to apply to being organized right now but REALLY it does. And it is FUN to set up a new planner! Now I'm not claiming any planner is the solution to everything. But this one is definitely going to help me start 2016 right. All the wonderful graphics & the bold, fun colors make me WANT to open it up each morning to see what I can get to work on. And the content? This is not just a planner. It is set of mini-classes on goals, SEO, social media and lots more all rolled up in to one planner! ***If you are not a blogger --- there are TONS of printable Home, Mom or Homeschooling planners out there! Here are a few I found in 5 minutes cruising around Pinterest. I was listening to music as I wrote this post & the song Overcomer by Mandisa came on. This song hits me hard every time I hear it. It is such a wonderful reminder that I'm not alone & can keep moving forward while hanging on to His promises! I'm not letting this fight get the best of me. Anyone else looking ahead at the next couple of months trying to get it all together? What are your ideas & hints? Share what you are doing! We all need all the help we can get! 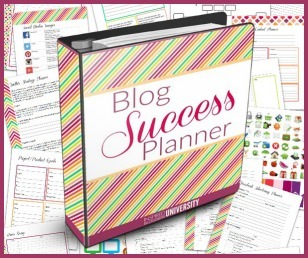 If you are blogger, definitely go check out the Blog Success Planner(affiliate link). It is AWESOME!